Dafna Moriya believes that art has the power to create a connection between the conscious and the unconscious; and to that end she explores consciousness with patients, students and trainees, to fathom the depths of the soul and experience. In her artwork, she examines the nonverbal force of creativity and encourages the viewer to remain within the metaphorical level without translating images into words. Her allowing the elements of an artwork to occur, as if inidependently of their own will, generates interplay between her painting activity and the developments unfolding on the canvas. During the work process on planned patterns, unplanned new elements suddenly burst forth, conquering areas in the painting and embellishing the canvas with colorful aesthetic beauty, an expanse of time and a window into the mind. In the process of creating her paintings, Moriya enters the intermediate realm between imagination and reality, and between the conscious and the unconscious. Although her paintings are very concrete, the values at the heart of her study are the shapes and colors, and the relationships between them. Moriya opens forms up with daringly impressive graphic movements, creating artworks that are abstract and free. The paintings are executed in spectacular colors on large-size canvases expressing the colorful personal language the artist has developed over the past few years, with all its telltale traits and remarkable presence. In this absolutely abstract but well-formed language, the paintings are constructed of layers of paint, with brushstrokes shaping the compositions. Moriya says that her artworks come from sailing into the depths, each one of them the product of a voyage to another world. The monumental base of her paintings is adapted to the length and depth of the journey, and every new element portrayed in the painting aspires to multiply, spread out, and take over other areas at its own characteristic pace and movement. However, since any such attempted growth obviously encounters other elements already existing on the canvas, it has to engage in negotiations with them to determine if it will conquer and obscure them, or else create a kind of symbiotic coexistence with them. Moriya´s paintings thus come into existence through a process of accumulating factors taken from a wide range of fields, and their development through the natural selection of creative evolution. The artworks do not seek to imitate reality, but rather express the dance taking place on the border line between the conscious and the unconscious, and between reality and its acquired interpretations. Shapes and colors draw viewers into a slow deciphering process and repetitive contemplation, each time discovering a fresh aspect of shape, color, path, or insight. Further observation reveals the painting´s diverse layers, the interaction between them or its absence, their various directions of movement and rhythms. The process of unraveling the painting´s enigmas sets spectators off on a journey into their own inner spaces. Moriya has a B.Sc. in Information Systems Engineering from the Computer Science Department at the Technion Institute in Haifa, Israel; supplementary studies in Psychology from Haifa University; an MPS in Art Therapy and Creativity Development from Pratt Institute in Brooklyn, New York; and a Ph.D. in Interdisciplinary Studies, majoring in Ethical and Creative Leadership from Union Institute and University in Cincinnati, Ohio. 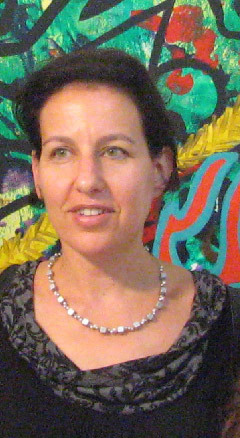 Her past experience includes working in information systems engineering; providing art therapy in various private and public schools, a treatment center and private practice in the U.S. and Israel; and teaching art therapy at Beit Berl College, Israel. "100 dreams 100 places one home"
"Vanishing lands", Group show, Design hotel ca-pisani, Venice. "Tower of Babel". Group show, Schema gallery, New York. "The woman with the iron wings", guest artist at Dina Merhav´s show, Ein Hod Gallery, Israel. "Stopover", Solo show, ZOA gallery. Tel Aviv, Israel. "Another time", Solo show, Shorashim gallery, Haifa, Israel. "Art for Peace", Group show, Terezin Memeorial Museum, Terezin, The Czech Republic. "Transition", Solo show, Ein Hod Gallery, Israel. "Time table on the table", Group show, ZOA gallery, Tel Aviv, Israel. "Black & White, almost", Solo show, Jerusalem Cinematheque, Israel. "Secrete art", Group show, Beit Many, Tel Aviv, Israel. "Unity flags - a dialogue between cultures", Group show, The Arab-Hebrew theater, Jaffa, Israel. "Time and space", Solo show, Merchav Leomanut, Jaffa, Israel. "Transitional Space #2", Solo show. Memior de l´Avenir. Paris. Artist messengers of peace, Group show, Czech Centre Prague. "Les Hivernales", Group show, Palais des Congres, Paris, France. "At my table", Group show, Haifa, Israel. Salon D´Automn, Group show, Jafa, Israel. "Transitionl Space #2" : Solo Show. The Artists House, Tel Aviv, Israel. "Transitional Space #1": Solo Show. The new gallery in Beit Aba Hushi, Haifa, Israel. "Medias": Group show: Association Memoire de l´Avenir. Paris, France. "Darkness": Group show: FusionArts Museum, New York, NY . "Culture Kiosk": Markers VII - Group show: Venice Bienalle, Italy. "Divine in Tent": Markers VI - The artist´s museum, Group show: Art-life Gallery, Venice, Italy; Kassel, Germany. "Containers of Soul", Group show in Mexico: The Maya culture Museum, Chatomel; The Museum of Kossomal; The congress center, Cancun; Emilia Cohen Gallery, Mexico City. "Pre-view for Transitional space #1", Ramat Hasharon, Israel. One-woman show - 20 paintings. "Art in the Industry street" Group show in Tel Aviv, curator: Irit Zomer. "Guf" Group show in Jerusalem and Tel Aviv. Group show at The New School University, NY. Group show at The Artists Association, Tel Aviv, Israel. "Internal View-External View," Ramat Hasharon, Israel. One-woman show - 24 paintings. "Artists Messengers of Peace", Eretz Israel Museum, Tel Aviv, Israel. Group show is now traveling to different places in the world. Pardess Hanna, Israel. One-woman show - 26 paintings.